Do you sometimes feel like nibbling something as a snack but not necessarily a big piece of cake? Portugal is not just about pasteis de nata when it comes to desserts! Even if I confess I have a soft spot for these delicacies, I must admit that these bolhinos de mel, small honey donuts are just as delicious! But you have to taste them warm! Bolhinos de mel, also known as pasteis de mel, are small beignets sprinkled with icing sugar and warm honey, not to be confused with pão de mel, which is similar to gingerbread. You do not have to let the dough rise like most donuts, which makes bolinhos mel very quick to prepare. The lemon zest is in my opinion absolutely necessary for the taste! Do not skip this step! Bolinhos de mel and bolinhos de chuva are very popular in Brazil and Portugal. The two recipes differ only in the shape of the donuts. Bolhinos de chuva are raindrop-shaped and are known in the United States as rain scones. It is difficult to know when these donuts were created! The recipe has been passed from mother to daughter. There are several variants across Portugal. 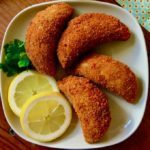 There is a variety of fish fritters which the Portuguese are very fond of. 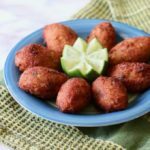 I am talking about bolinhos de bacalhau (or pasteis de bacalhau). These fritters, made from potatoes, parsley and cod, are widespread in the Lisbon and southern Portugal regions. It is the local “fish and chips”! Crispy on the outside, and fluffy on the inside. But the Portuguese have a habit of feasting on these savory beignets as appetizers and accompany them with olives, salad and rice. You have probably already seen these donuts somewhere! They look like accras de morue (cod fritters) from the French West Indies. 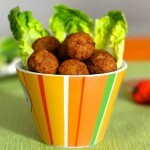 – Grease your hands before forming small round balls! It helps to shape well round and smooth donuts. – Pay attention to the temperature of the oil. If it is too hot, the donuts will be cooked on the outside but completely raw inside. 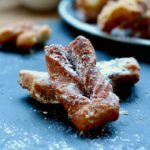 – We tasted them with honey! A delight. But nothing prevents you to top them with a good chocolate syrup just like profiteroles. Pets de nonne (nun’s puffs)! 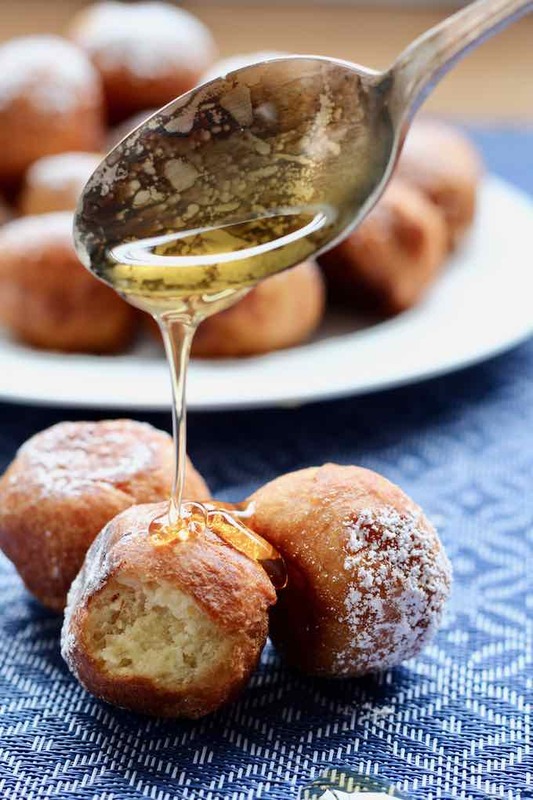 These donuts are very similar, except for the honey! The difference also lies in the consistency of the dough. In fact, French nun’s puffs are made from choux pastry, which makes them lighter in consistency. Bolinhos de mel are much more compact without being heavy. Bolhinos de mel are sold in paper cones at fairs and festivals around Portugal. 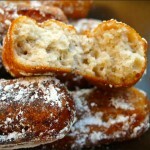 In Italy, bolinhos de mel are called struffoli. Their dough contains honey and cinnamon. They are also found in the Naples area. The ancient Greeks had their version of the bolinhos de mel which they called enkris (or enkrides). The enkris were fried in olive oil. In India, Pakistan, Sri Lanka, Bangladesh and Myanmar, these local donuts are known as gulab jamun. One of the differences with bolinhos de mel is the syrup! 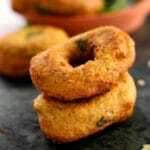 After being deep-fried, these Indian donuts are soaked in a sugar syrup perfumed with rose water, saffron or cardamom. In Cape Verde, bolinhos de mandioca are the local specialty. In the dough, the sugar is replaced by molasse and the small balls are rolled in tapioca flour before cooking. 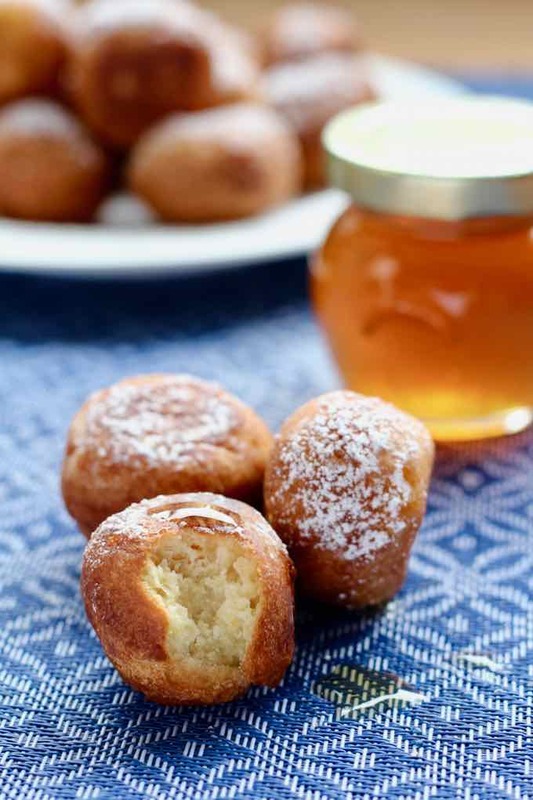 No frying, as these little donuts are baked instead! 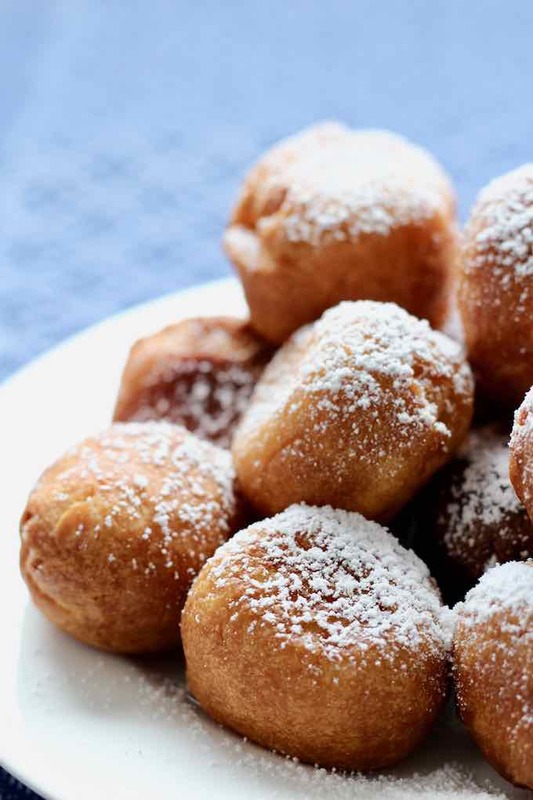 In Nigeria and Sierra Leone, bolinhos de mel are called puff-puff. They are found under other names: bofrot in Ghana, kala in Liberia and mikate in Congo. These light donuts do not contain baking powder but fresh yeast instead. 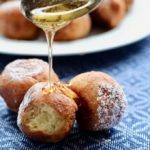 Bolinhos de mel (also called pasteis de mel) are delicious little Portuguese honey beignets, traditionally flavored with cinnamon, clove and lemon. Mix flour, baking powder, lemon zest, cinnamon and clove. In the bowl of a stand mixer, mix the eggs, honey, sugar and margarine and add the previous mixture. Gradually add the milk and knead until obtaining a light dough that does not stick to the hands. If necessary, add a small amount of milk if the dough is too hard or add flour if it is too soft. Form small balls of dough about 1 to 1½ inches in diameter and fry immediately in a pot with hot oil until golden brown. Drain on paper towels and sprinkle with sugar or icing sugar. Noticed that in Europe! The simplest and most tasteful dessert! I am in love with those donuts! Thank you for the recipe!